Bay View in Askam-in-Furness sleeps 5 people. 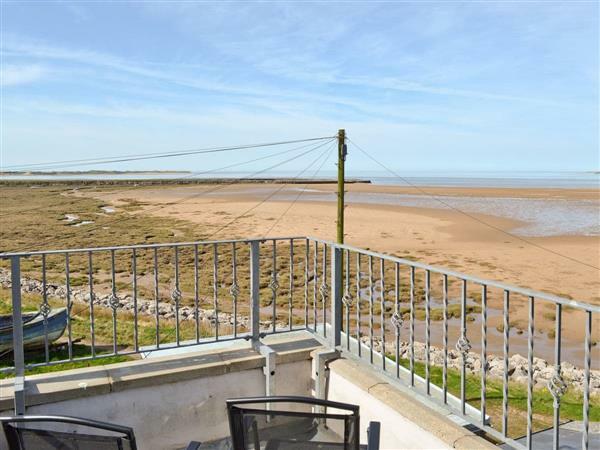 Bay View boasts spectacular far reaching views of the surrounding fells and Duddon Estuary, especially from the balcony where the stunning sunsets can be admired. This terraced property is an ideal holiday property nestled in the heart of Askham village, Bay View House offers a comfortable base for exploring both the Lake District and western coastline. Askam-in-Furness lies on the Furness Peninsula and is an area steeped in history, the village was founded in the 18-century when iron ore was discovered locally and had the second largest deposits of iron ore in the country. Askam, boasts magnificent views over the Duddon Valley to the Lakelands fells and beyond. Duddon Estuary is home to the Natterjack toad and other wildlife sheltering in the shallow pools. The market town of Ulverston, home to the Laurel and Hardy Museum is only a 10-minute drive away. The award winning South Lakes Wildlife Park is just around the corner. The train line, which hugs the west coast and leaves from Askam station is a brilliant way to explore that part of the lakes. The choice is yours, with much more on offer, once you discover this area you will never want to leave! Beach 10 yards. Shop 800 yards, pub 400 yards and restaurant ¾ mile. Ground floor: Living/dining room with patio doors and tiled floor. Kitchen with tiled floor. First floor: 2 bedrooms: 1 double, 1 single. Bathroom with shower over bath and toilet. Second floor: 1 double (5ft) bedroom with patio doors and en-suite shower room and toilet. Gas coal-effect fire in living room included. Gas central heating, gas, electric, bed linen and towels included. Cot and high-chair on request. Four Freeview TVs. DVD. CD. Gas hob. Electric oven. Microwave. Washing machine. Dish washer. Fridge/Freezer. Small enclosed courtyard with patio, sitting-out area and furniture. Balcony. Bar-be-que. On road parking. Cycle store. Welcome pack. No smoking. NB: 1 step in courtyard. Holidays at Bay View run from Saturday to Saturday. For a better idea of where Bay View is, you can see Bay View on the map below. Bay View is in Cumbria; should you be on the lookout for a special offer, you can find all the special offers in Cumbria. It's always worth checking to see what is on offer at the moment. Do you want to holiday near Bay View (29046), you can see other cottages within 25 miles of Bay View; have a look to find your perfect holiday location.